Today I was at school with my kids to welcome and give a tour to a group of prospective families who were considering our school. Fontella, a fellow parent and friend, was there too with her daughters, and she gave me a warm hug and freely shared her lovely smile. Last year, Fontella brought a Jamaican curry chicken to one of the school's Multicultural family group get togethers. It was the best curry chicken I had eaten, because the chicken was the softest and silkiest I had ever tasted. It was addictive. After that night, I would fondly tease Fontella with a "Where is my curry chicken?" Well today was no different. I went on and on about where was my curry chicken, hugged her goodbye, and went home. A couple hours later, I got a call from Fontella. Surprise! She went home and actually made curry chicken, and she called me to come pick up some. Don't you agree I have lovely friends? 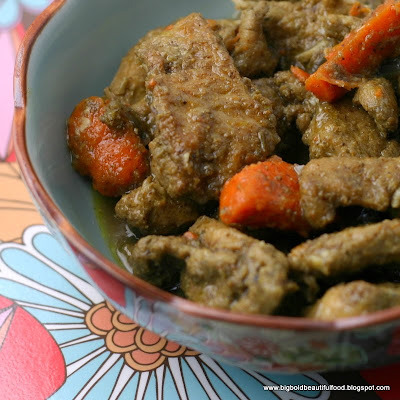 This time she made a curry with Trinidadian curry powder, which she called a dark curry. I asked her how she went about cooking curry, since I was taught how to make other curries -- Japanese, Thai, Malaysian, Jamaican, Indian, and Guyanese -- from other friends. Like my Jamaican friend Coleen, Fontella uses pre-mixed curry powders, bought from the local Caribbean store. There's Jamaican and Trinidadian curry powders, duck/goat curry powders, etc. If Fontella is using chicken breasts, she slices it thin and dusts it with Goya adobo powder, cumin, and onion powder, so that it can marinate in the spices. She fries some garlic in oil and takes it out so it doesn't burn. After frying whole allspice berries in the oil until fragrant, she adds the curry powder, chicken, onions, and garlic and cooks them slowly for a few minutes, then adds a little water and cooks it at a low simmer, as Fontella says, "until it's done." We figured out this was about 15 minutes. Eat with rice for a lovely meal. P.S. Fontella's handsome, young son reminds us to avoid those allspice berries -- they're for flavor, not for eating! P.S.2 For a similar recipe, go to my story on Jamaican curry chicken. 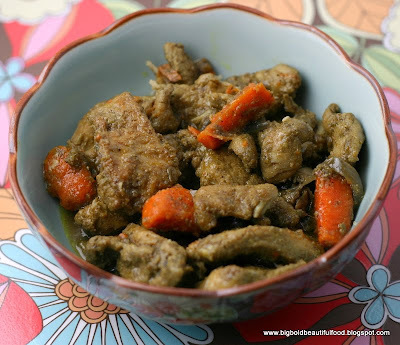 If you want to make it Trinidadian style, use Trinadadian curry powder instead of Jamaican curry powder. Even her name is lovely:) All the flavors sound soo good..What a dear friend! MMMMMMMMMMMMM,...what a lovely & easy meal, but so tasty! What a lovely friend and what a gorgeous curry! How sweet! that curry looks so delicious and what a wonderful way to learn a new cuisine.